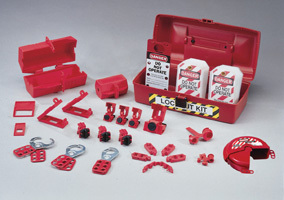 This comprehensive plant facility lockout and tagout kit keeps all necessary devices in one place. The kit contains lockouts for 277/480/600V breakers, plugs, valves, wall switches and multi-pole breakers; fuse blockouts; safety hasps; and multiple “Do Not Operate” lockout tags. The toolbox resists oil and chemicals common in industrial facilities.